Manchester Camerata is commited to engaging with composers of all ages to create new works. Each year we run a composing project which is connected in some way with our season theme which in 2011/12 is Portraits. We’re currently calling for new works inspired by Portraits in Manchester Art Gallery. The project is open to any composers studying at the RNCM (Senior and Junior) and Chetham’s School of Music. The instrumentation for the new composition must be the following seven players: Flute (doubling piccolo), clarinet (doubling bass), violin, viola, cello, harp, one percussionist. The percussion must be limited to any handheld instruments – ie no timpani or tuned percussion. Composers are completely free to decide on the method, structure, style and content of their own work, as long as it follows the above instrumentation. Compositions are to be no more than 5 minutes in length. 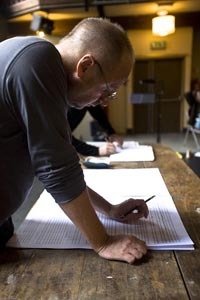 The deadline for submissions of scores and parts is Friday 16 December 2011.One of the works will be selected to be performed at the RNCM on Saturday 10 March 2012. 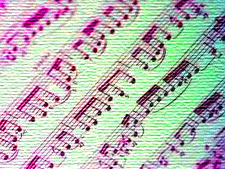 Ten Successful scores will be workshopped on Saturday 21 January 2012 at the RNCM main Concert Hall with members of Camerata. 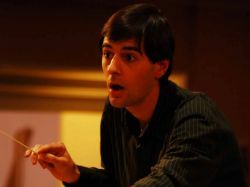 The British composer Peter Wiegold (above) will be at the workshop to give feedback and advice, and be on the selection panel with Manus Carey for choosing which work is performed in Camerata’s main season. Eduardo Portal (right) will conduct. The workshop will also be open to the general public. The project is generously supported by the Art Mentor Foundation Lucerne. If your are interested, tell your Head of Composition or contact Camerata’s Head of Creative Programming, Manus Carey for more information either by email mcarey@manchestercamerata.com or call 0161 908 0046.